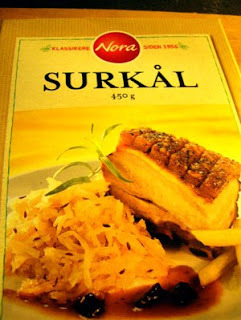 Enjoy - Food & Travel: Ribbe med surkål!! I have previously told my readers on the ultimate Christmas test - how to make Pork Rib with crispy crackling, the way our mothers did. My mother died in the year 2000 and I still struggle to get my ribbe perfect, and today I will have another try. I have two friends for dinner and I will make it the easy way. Roasting on low temperature a very long time, so that I may leave the house to do some Christmas shopping. The pork rib has been left marinating for a few hours. I made an untraditional marinade, chili and barbecue spices. The theory is that the sweet chili will help crisp the crackling at the end of the cooking time. The plan is to bake potatoes, and Brussels sprouts, Christmas sausage and meatballs under the dripping fat. I will keep you informed on how this ended as the day progress. The Pork Rib in in the oven, at very low heat 100C / 210 F and will stay there for at least 7 hours. I have poured hot water to steam the rib. This to soften the cracklings and make them crispy at the end of the cooking time. Yum!! I then leave the house to do some serious shopping. Back in the house. Three presenta have been bought. The rib has been steaming in the oven for 5 hours and 30 minutes. It is time to prepare the other ingredients. I place the rib on a grill and place the chopped potatoes on a tray underneath it. 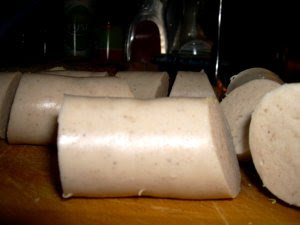 This will allow them to fry in the fat from the pork. I have remove the liquid. This will be mixed with a stock cube and act as a base for my gravy. At this point I increase the heat to 200C / 400F. 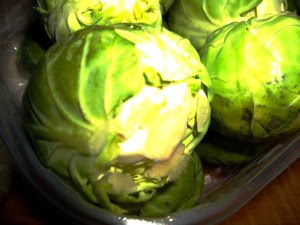 Brussels sprouts join the potatoes with two other traditional ingredients. They are medisterkaker i.e. meatballs made from ground pork and beef with up to 25% fat, and Christmas sausage. These are ingredients that a real foodie should make himself, but as I am extremely lazy, I tend to buy them. All in all, these products hold a decent quality, in fact they are so good that you do not hesitate to buy them. 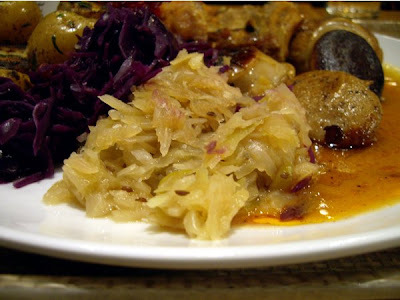 I boil up a kettle of hot water and add a bag of ready made surkål, Norwegian sauerkraut. This is the next best thing, as a proper housewife or a foodie should in all decency make their own. 15 minutes in hot water and it is heated through. 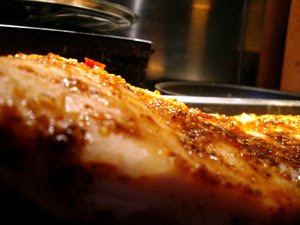 The rib is removed from the oven. Sweet chili sauce is not a good idea, as the cracklings burnt due to the sugar in it and did not turn crispy. Another failure. Next time I will use the traditional salt and pepper and hope for a better result. Then I may serve the most delicious long roast rib to my friends, with Brussels sprouts, meatballs, Christmas sausage, roasted potatoes and brown gravy.